WireACake & WireACookie It's a Piece of Cake to Ship Online! We have transitioned from photo cakes to offering the decorated photo custom 3.25" sugar cookies for shipping to any US address within the 50 states, including military installations at home! Cookie details can be found on WireACookie.com CLICK HERE to visit our new website exclusively for the COOKIES! 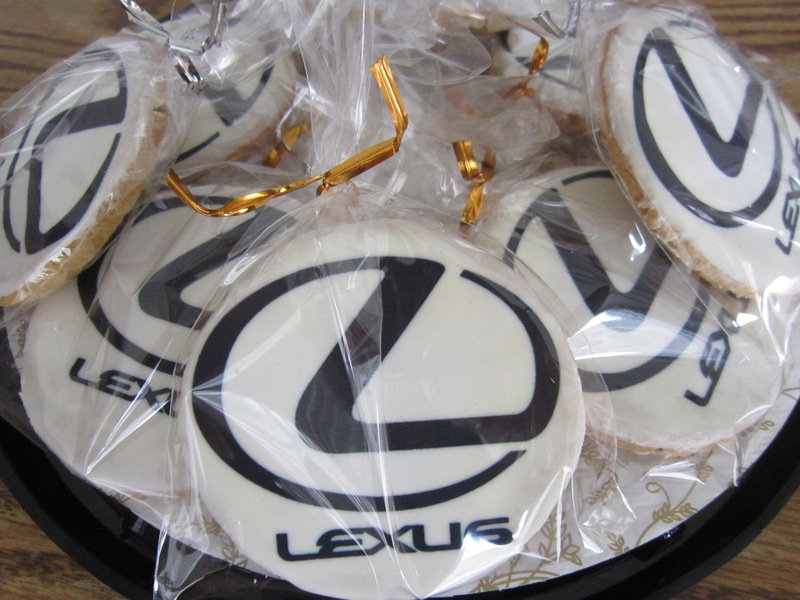 Our Personalized Photo Cookies make a sweet impression! everything you strive for in your company. One Recipe = One Great Product EVERY time! from the oldest and most established Telecake Cake Delivery Service since 1987! Please call 1-800-947-3222 to speak with one of our representatives who will be happy to discuss your gift giving needs! Corporate Anniversary approaching, enhance your public image by drawing attention to one of your most important assets, namely longevity in your field. Our purpose is to help you draw attention to the well earned positive perception that comes from longevity. We offer a unique gift idea for that personal or corporate occasion. We will arrange for sweets to be delivered to your offices and client affiliates all across the USA including AK & HI at no additional cost. 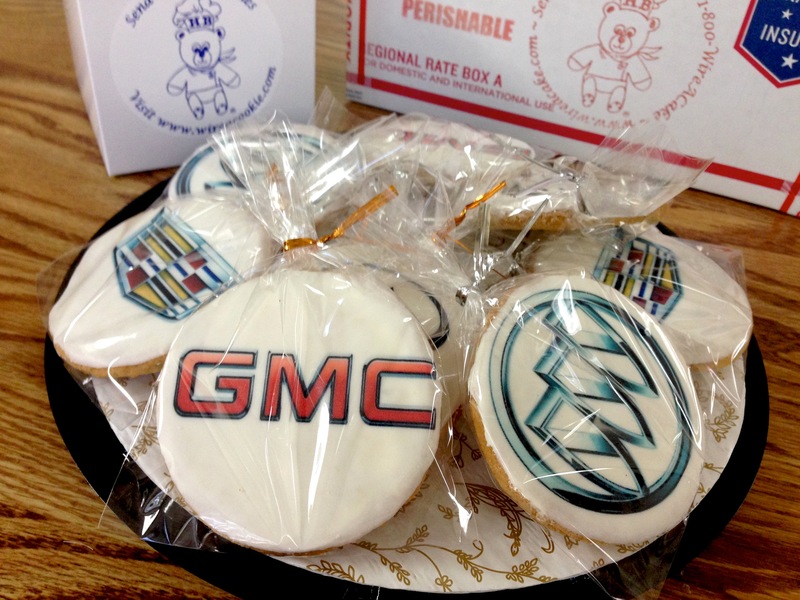 Celebration sugar cookies can be decorated with your company logo and message reproduced on edible frosting sheets. 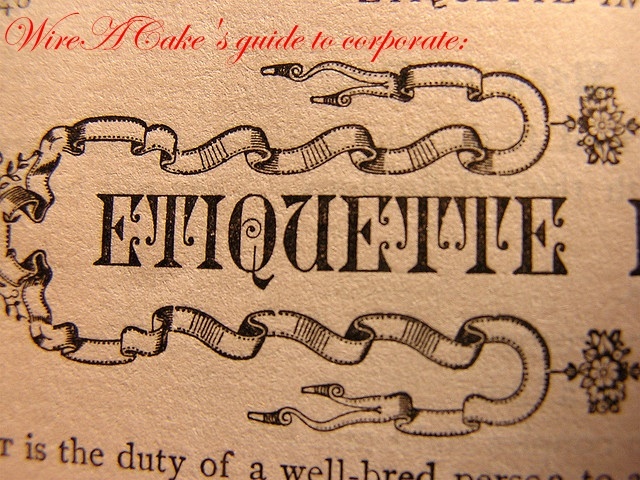 WireACake.com/HB Bakery Connection was contracted by Disney/ABC Domestic Television to provide celebration cakes to their 206 affiliate TV stations across the USA. 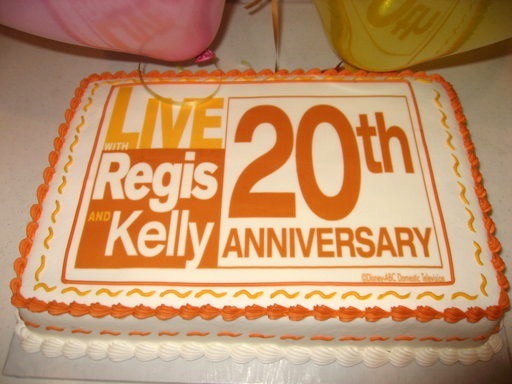 This was to celebrate the 20th anniversary of "Live with Regis & Kelly" on September 14, 2007. WireACake.com/HB Bakery Connection is happy to offer computerized cookie decorating. We will transfer artwork, photographs or logos onto a baked to order, 3.25inch edible frosting circle using specially formulated edible ink. You can email the logo in .gif or .jpeg format advanced notice is required to allow for the images to be reproduced. The cookies have a festive appearance showcasing your logo; individually wrapped in a cellophane party bag and tied off with a shiny twistie. 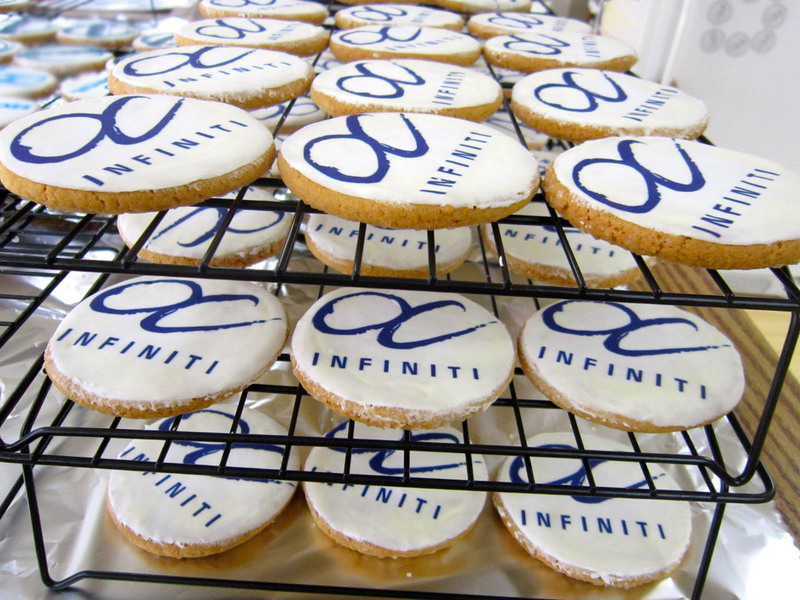 We have offices that have the cookies as a "hospitality" gift at the front reception desk for clients to take away after a visit! 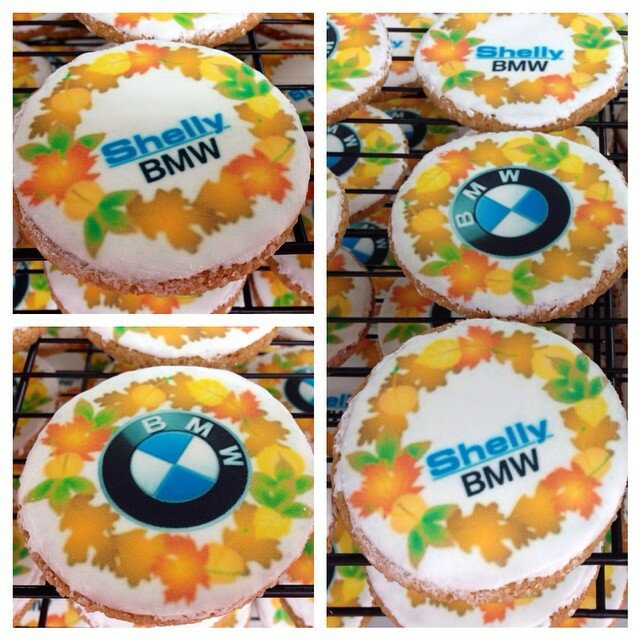 We can transform your logo artwork right onto the cookie using specially formulated edible inks! 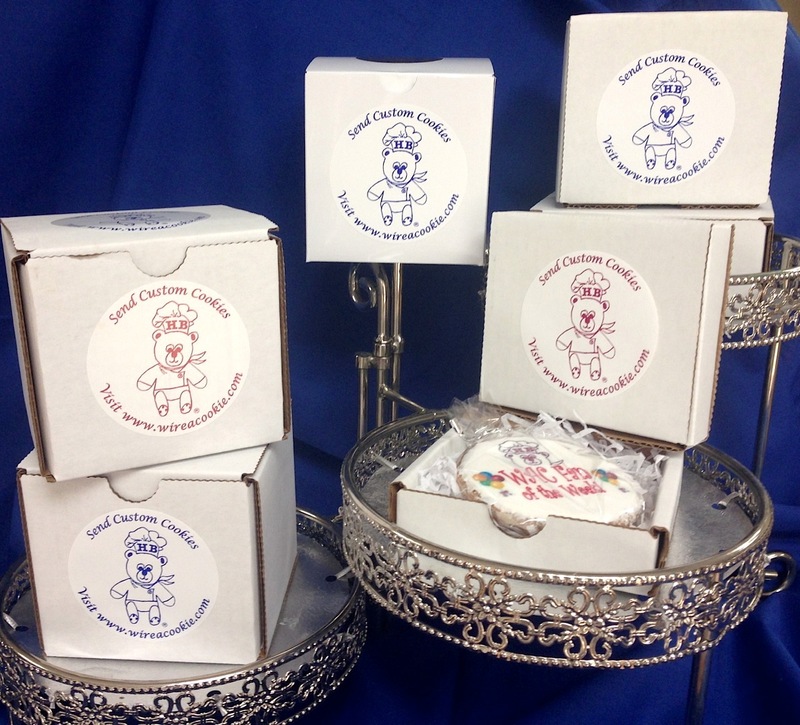 Our corporate gift cake boxes for a professional presentation. TERMS: 40% deposit required at time of order, balance to be invoiced net 30 days. Changes to orders are subject to 10% surcharge. Any cancellations subject to full charge. 2-3 week notice on corporate orders preferred (but if it's less time give us a call anyway we can't say no to business).Your order will be handled in a professional and courteous manner. Our service is unique and leaves a lasting impression! Copyright 2012-2015 HB Bakery Connection, HB Inc.